Check out our prices for Lamb! 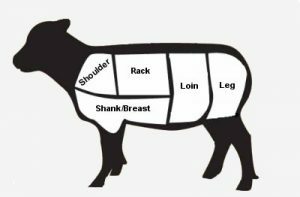 A normal sized serving of lamb contains about 35 grams of of high quality protein and can provide 20 per cent of the daily recommended amount of iron for men and 12 per cent for women. Studies have shown iron to be instrumental the formation of red blood cells. According to the BBC; Iron found in red meat. sometimes referred to as ‘haem iron’, is more easily absorbed by our bodies. Lamb is also a great source of zinc, B vitamins and Thiamine, providing 45 per cent of your daily requirement of zinc and will satisfy your B12 needs as well. Our lamb is very low in fat, what little remains is at least 50% unsaturated and most of the unsaturated fat is monounsaturated. The AHA has reported monounsaturated fats help reduce LDL cholesterol levels lowering the risk of coronary artery disease and stroke. With a higl level of Vitamin E the monounsaturated fats in lamb meat also help your body develop and maintain a strong cell structure.